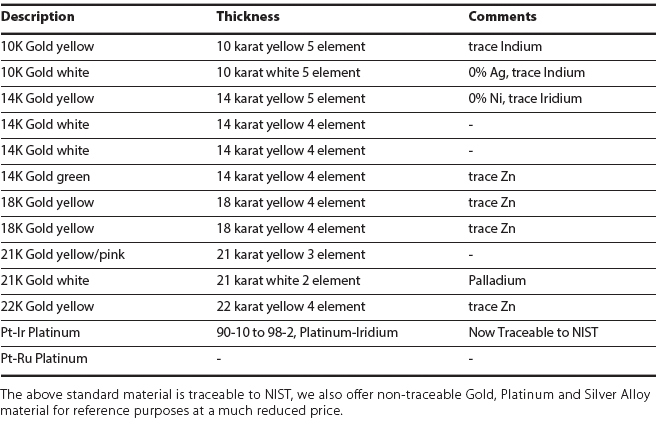 Traceable and Non-Traceable CRM: Although we have a limited selection of NIST traceable Precious Alloy standards, we do have a larger selection of non-traceable reference material for precious metals analysis. Our standards are verified via Fire Assay and ICP testing. NIST Traceable Standards are mounted on a metal base, non-traceable standards are un-mounted and can vary in size from ½” to 1” square depending on the system that the standard is used with.